Lightly coat a 9-inch pie plate with cooking spray. Set aside. For the crust: In a medium bowl, stir together crushed cookies, ground almonds and sugar. Drizzle the melted butter over mixture; toss until coated with butter. Spread cookie mixture in prepared pie plate; press evenly onto bottom and sides. Bake in a 375 degrees F oven for 7 to 8 minutes or until edges are golden. Cool completely on a wire rack. Set aside. For filling: Drain cherries, reserving syrup. Quarter cherries; set aside. Add enough water to syrup to measure 1 cup liquid. In a medium saucepan, bring the 1 cup liquid to boiling; remove from heat. Add gelatin; stir until gelatin is dissolved. Pour gelatin mixture into a large bowl. Add yogurt by spoonfuls, stirring until combined. Chill 1 hour 30 minutes or until mixture mounds when spooned. Fold cherries into yogurt mixture. Chill again, if necessary, until mixture mounds. Turn into baked shell. Chill 4 to 6 hours or until set. 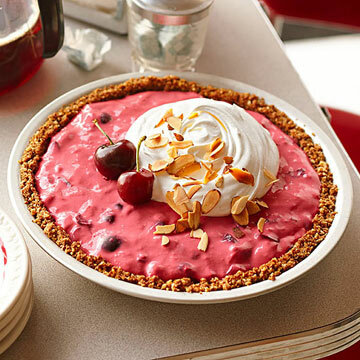 Before serving, garnish chilled pie with whipped cream, fresh dark sweet cherries with stems and sliced almonds. Chill, covered, to store.